Scottish celebrity Sally Magnusson’s fictional friend has been brought to life with a little help from the team at Eagle Couriers. 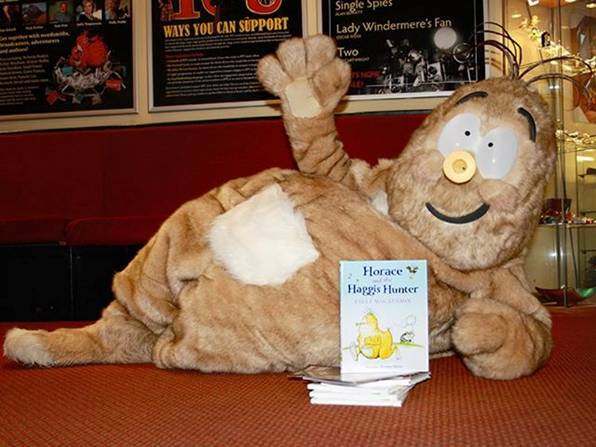 Ahead of the launch of the TV presenter’s second Horace the Haggis tale, Scotland’s largest independent courier has been charged with the job of transporting a life-sized costume of the fictional haggis around the country on a bookshop tour. Perhaps more famous for her role as a BBC Reporting Scotland presenter, Sally is in fact no stranger to putting pen to paper and has a number of titles behind her. Turning to the world of children’s books and inspired by her own brood of five, her tales personify the Scottish traditional dish. To celebrate the release of the second book ‘Horace the Haggis and the Ghost Dog’, Black and White publishers charged Eagle Couriers with the task of transporting a life-size Horace costume around Scotland to visit his young readers. Jerry Stewart, Director of Eagle Couriers, said: “Over the years we have had our fair share of unique requests but this one has been particularly memorable. It may seem an unusual package for the Eagle Couriers team to deliver, however with over 28 years experience in the industry they have certainly encountered a wide variety of weird and wonderful creatures. A particularly notable example was when one driver spent his afternoon alongside a box of tiny live frogs as he drove the croaking creatures from Edinburgh to their new home in Glasgow. Indeed, Eagle Couriers have quite a history of delivering animals to their owners with another case being when they successfully helped to reunite a cat with his owner in Penicuik after they had been separated by some 478 miles. The secret to Eagle Courier’s management and handling of such a diverse range of packages is undoubtedly down to their extensive staff training ensuring that each and every client is satisfied to the highest possible level. In total, they provide services to over 3,500 clients and employ over 100 drivers who ensure that client’s packages arrive on time and intact.